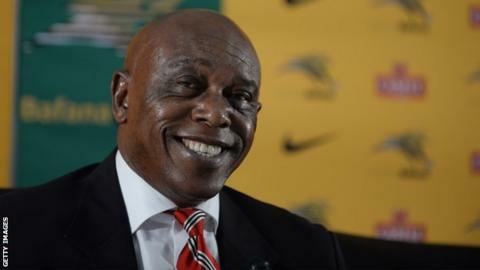 South Africa's Tokyo Sexwale says he is "ready to take on the world" in his bid to become Fifa president and aims to repair the "damaged" organisation. The 62-year-old won the required support to enter his application on Monday to stand in February's election. "I am going into this campaign as a candidate of my country with the confidence bestowed in me to make sure that we win," Sexwale said. "But win or lose people will know there was an African who shook things up." Candidates had until 23:00 GMT on Monday to submit the relevant paperwork - together with letters of support from five football associations. Sexwale is one of eight men who were able to do so and put themselves in the running to contest the elections, which will be held on 26 February. "I think it was a vote of confidence by people who I can only say understand who I am and what I will be able to bring to football," he added. "Fifa, the organisation of the beautiful game, is damaged. The brand is severely undermined." Sexwale has been a member of Fifa's anti-discrimination task force, has conducted talks between the Palestinian and Israeli federations, and was a member of the bid team and the organising committee for the 2010 World Cup, the first held in Africa. "Having spent time inside Fifa, I am more than ready to take on the world," he added. Fifa is embroiled in the worst scandal of its 111-year history, with the United States having indicted several Fifa officials for bribery, money laundering and wire fraud in May. Swiss authorities are also investigating the decision to award the 2018 and 2022 World Cups to Russia and Qatar respectively. Both countries deny any wrongdoing. Blatter and Michel Platini, president of European football's governing body Uefa, who had been favourite to succeed him, have been suspended for 90 days pending a full investigation by Fifa's Ethics Committee. Both deny any wrongdoing.